Ask 1099Mom: How Do You Make Money as a Blogger? I'm sure you've seen emails in your inbox (hopefully, your spam folder) that promise you can make $4,000 a week online with your mom blog. These emails are a scam, as they promise a result that cannot be achieved by most, and most definitely not in the manner you'd expect. These two important points can help you set reasonable expectations before getting your hopes up about being financially secure via a blog. For this Post, let's address #1... Just how DO you make money with a blog? Companies can pay you to place ads on your site. These can come in the form of text links, banner ads, or sponsored posts. Payment can range from a few cents per click to hundreds of dollars for a single blog post to even thousands of dollars for a full campaign of a combination of several posts, banner ads, etc. This is where you earn a commission for items or services sold when readers click on a special link and buy on the site the link sends them to. Commissions range from a percentage of the total amount sold to hundreds of dollars per sale (such as for cruises, credit card accounts, etc.) Affiliate sales can be generated from sites like Amazon, Walmart, and GoDaddy.com. Affiliate programs that many bloggers use to find advertisers include Linkshare and Escalate Network. If you have a popular blog on a particular topic, you can write a book and sell it online without ever working with a traditional publisher. There are many ways to create and market an ebook, but working with affiliates to help you sell can make your book even more successful. (See Angela England's 30 Days to Make and Sell a Fabulous eBook for everything you need to know about getting started!) eBooks can be sold for $1 - $79, depending on the content. If you offer an exclusive service, information or community features that your readers would pay for, it might be profitable to offer access to a portion of your site (or a newsletter or other mailing) for a fee. Membership pricing can range from $1 a month to $499 a month, depending on what you claim to offer and how exclusive the group is. Sites that can help you build your membership group include SubHub, Wishlist, and MemberGate. If your blog showcases some excellent writing, you may be asked to write for others as a freelance writer. Bloggers have found work in magazines, on corporate websites, as guest bloggers for celebrities, and even as ghostwriters for traditionally-published books. Payment can range from a few pennies to $1.50 per word, although payment is usually made on a per piece basis. Bloggers have used their influence to create even more opportunities, proof that the actual "blogging" isn't where the money is at. The new generation of bloggers agree that a blog is a platform for creating a brand that can extend into any business niche you wish to succeed in. To get even more ideas for how your blog can create cash for you and your family, we recommend the Digital Mom Handbook, which covers all of these topics -- and more -- in detail. 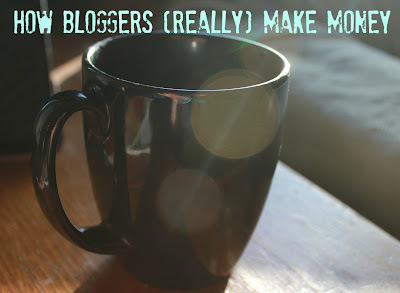 Great summary of some of the amazing ways bloggers are making money. I would add to that list Republishing Content - not in ebooks, but turning one of your popular or insightful blog posts into an expanded article or essay for a print magazine can be another way to leverage the writing you're already doing into an additional stream of income. You actually said it better than I did, Angela ;) Enjoy your coffee, and thanks for the comment!